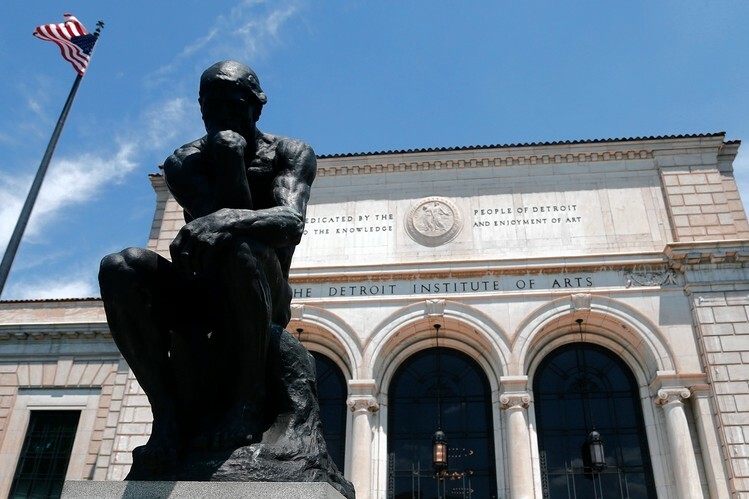 During the bankruptcy proceedings, city creditors sought permission to get some of the money Detroit owed them through the liquidation of masterpieces from the DIA’s city-owned collection. Instead, under the “Grand Bargain” approved by the court, the city is to receive $816 million over 20 years from nonprofit foundations, the state of Michigan and DIA donors, to be used to reduce the cuts to city workers’ pensions and to allow for the transfer of ownership of the museum’s collection and building from the city to the museum’s own nonprofit corporation. The DIA, at this writing, has raised some $87 million of its $100 million commitment to the Grand Bargain. But there are other museums around the country whose objects are owned, in whole or in part, by government entities, and the DIA’s excruciating experience in defending its collection against the predations of the city’s creditors should be a wake-up call to them. They should do proactively what it took the DIA millions of dollars and more than 16 months of legal wrangling to accomplish—put their collections beyond the reach of municipal creditors. The experience of Detroit—once prosperous, now fallen on hard times—proves that what seems inconceivable today may become inescapable tomorrow. Surprisingly, however, officials at several museums with potentially vulnerable collections feel no urgency about protecting them, citing the financial soundness of their localities and the strong support they receive from government officials and the public. But as recent events have shown, when a city declares bankruptcy (Detroit’s being the 13th since 2008), a community’s love of culture and its government’s previous history of solvency are no insurance against an onslaught by creditors, who may love a museum for the wrong reasons—as a treasure trove of monetizable assets. Similarly, Gail Andrews, director of the Birmingham Museum of Art, in Alabama, said: “We have no plans to change” the ownership by the city of part of the museum’s collection. “The city has been a steadfast and important partner of the museum, both of us deeply valuing the collection and its importance to the community,” she noted. Even the director of a major encyclopedic museum, Michael Govan of the Los Angeles County Museum of Art, feels no pressing need to shield the estimated 10% of LACMA’s collection that is county-owned: “Los Angeles’s good financial condition and its commitment to culture . . . meant that we didn’t really feel we were at risk,” Mr. Govan stated. Nevertheless, in light of the DIA’s experience, LACMA officials have begun exploring the possible future transfer of the objects that are county-owned to museum ownership. At the Walters Art Museum, Baltimore, whose 23,000-object founding collection is city-owned, executive director Julia Marciari-Alexander said that the takeaway from the Detroit ruling is this: “It is important for us to talk with the city and with our trustees and to have these conversations [about ownership], which, frankly, no one wanted to have before.” Initial talks have already begun and “the situation and ruling in Detroit provides an incredibly useful framework for these discussions, going forward,” she said. Richard Levin, the DIA’s lead bankruptcy attorney, suggests a pre-emptive defense for those museums with city-owned collections that are not yet in the cross hairs of creditors. On the same day as Judge Rhodes’s ruling, Mr. Levin told attendees at a symposium on art law held in New York that museums and city governments should “see what assets you have that you think might be vulnerable and find a way, properly under state law, to put [those assets] in a charitable trust,” to protect them for the city’s residents. Some museums with government-owned objects have already done this. They include the Fine Arts Museums of San Francisco, that city’s Asian Art Museum, and the Philadelphia Museum of Art. Their city-owned works—the entire collections of the first two; the John G. Johnson Collection at the PMA—are held for the benefit of the public under the terms of charitable trusts that protect them from liquidation to satisfy their cities’ debts. Similar protection was provided by the 1972 transfer of the Saint Louis Art Museum’s collection from city ownership to the museum’s own state government subdistrict, according to SLAM’s attorney, David Linenbroker. That said, the knowing violation of these standards by several financially desperate cultural institutions (most recently, the Delaware Art Museum) has created an environment that gives a cloak of legitimacy to the notion of monetizing a museum’s art to defray debt. According to Mr. Levin, Detroit’s creditors “argued that the [AAMD] guidelines were just advisory and not binding,” since several art museums had previously disregarded them. Having passed its grueling test in U.S. Bankruptcy Court, the DIA is now poised to embrace its future, with its collection intact and confidence restored. “I’m hopeful this will give us a boost in fundraising,” said Annmarie Erickson, the museum’s executive vice president and chief operating officer, noting that the DIA had “kept aside” from the Grand Bargain campaign “a category of donors who we knew loved the museum and . . . would be willing to support endowment. We have a short list to begin with and we’re looking to grow that.” She added, “I know there are people who were waiting in the wings to see how the bankruptcy played out” before deciding to donate. Ms. Rosenbaum writes on art and museums for the Journal and blogs as CultureGrrl at www.artsjournal.com/culturegrrl.